Posted on Thu, Feb 14, 2013 : 5:59 a.m. Taking a cue from his customers, Domino’s Pizza CEO Patrick Doyle hopes to reinvent the pizza store experience. The Ann Arbor Township-based company is rolling out redesigned stores in certain markets across the U.S., including the new location in the Traver Village Shopping Center. “What our customers told us they want is to be able to see us make the pizza,” he continued. The newly designed stores feature open kitchens so customers can see employees spinning dough in the air and prepping pizzas. It includes interactive features such as a chalkboard for customers to write comments. 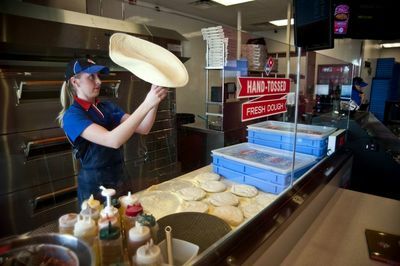 A Domino's Pizza employee flipping pizza dough behind a glass wall at Ann Arbor's newest store. “We’re putting these great handmade pizzas up front and center and it’s really kind of the old pizzeria tradition,” Doyle said. The new Ann Arbor store on Plymouth Road is one of the first Domino’s locations in Michigan to feature the redesign. Franchisee Dave Cesarini relocated Domino’s from Plymouth Road Mall to the neighboring Traver Village, and the store is having its soft opening this week. With direct visibility off Plymouth Road, additional square footage and the updated look, Cesarini expects the new location will result in a sales bump. Cesarini owns several Domino’s franchises. “Once we launch this from the grand opening standpoint, our sales absolutely - and our customers - will increase,” he said. The store will have a grand opening celebration in March. Doyle said the company also is testing the remodeled concept in the Seattle market, and it could become the standard look for Domino’s if customers have positive feedback. The move is one of a series of changes for Domino’s since the company overhauled its core pizza recipe in 2009. Doyle said transparency has been a goal for the company, which explains the multi-million dollar marketing campaign Domino’s used to tell customers its old pizza product was subpar. Since then, Domino’s has rolled out a series of additional menu changes as it expands the brand, increases revenue and grows its store count. It opened its 10,000th store last year and reported a net income of $26 million during the third quarter of 2012. Domino’s also recently renewed its lease for more than 220,000 square feet in Ann Arbor Township’s Domino’s Farms Office Park where the company is headquarted. Doyle said Domino’s will “never” stop updating and changing with its customers. Tue, Feb 19, 2013 : 2:20 p.m.
Whatever your reviews are on the recipe...the Cesarini family lives in Ann Arbor and is a consistent, generous donor to many non-profit organizations, the AAPS, charter schools and more in our Ann Arbor community. Thank you Cesarini's and best of luck to you with your new stores! Fri, Feb 15, 2013 : 12:30 a.m.
New looks mean nothing, you have to make a great pizza to survive. Number one in Ypsi is Aubreey's, number two is Jet's. There is no number three. Fri, Feb 15, 2013 : 9:40 a.m.
Aubrey's at Depot Town 1 Aubrey's at Whitaker Rd # 3? Fri, Feb 15, 2013 : 12:24 a.m.
Fri, Feb 15, 2013 : 2:02 p.m.
Fri, Feb 15, 2013 : 1:19 p.m.
Life expectancies are up 15-20 years in the past half century. Clearly you need to rethink your views of the world. The stress you incur looking at things this way is what will shorten your life. Thu, Feb 14, 2013 : 8:28 p.m. I have never been inside a Dominos. I always assumed there was a checkout desk for those who wanted to do their own driving and save on the &quot;free&quot; delivery. I never had any idea that there was a place to sit down and eat. Thu, Feb 14, 2013 : 11:36 p.m.
Thu, Feb 14, 2013 : 7:30 p.m.
Thu, Feb 14, 2013 : 7:06 p.m.
&quot;The fact is, better than one in three of our customers come into our stores for carryout,&quot; Thanks to your company's usurious delivery charges, sir. Thu, Feb 14, 2013 : 11:35 p.m. The 2.35 at dominos vs the 2.99 at nypd or I think pizza house is similar. Delivery is expensive and it might as well be .. It's a luxury item in my opinion. Don't like the fees ? Go pick it up. Thu, Feb 14, 2013 : 5:14 p.m. I lost my appetite for Dominos a couple years ago when they promoted a new, tasty, fantastic tomato sauce. I decided to try it, bought one, and I swear it didn't have any sauce on it at all. So now I am a Jets pizza fan. Fri, Feb 15, 2013 : 2:55 a.m. Agreed - I had one today, and it was pretty tasty, but almost no sauce at all. Thu, Feb 14, 2013 : 11:33 p.m.
Thu, Feb 14, 2013 : 5:34 p.m. Jets has tasty sauce, and that great deep-dish, olive oil coated, crispy crust. Domino's new deep dish offering has some of the same qualities, but not as good as Jets. Thu, Feb 14, 2013 : 4:40 p.m. Jets is way better and so is Papa Ramanos even though their ann arbor location closed. Although I did like Dominos Gluten free pizza. I was pleasantly surprised. Thu, Feb 14, 2013 : 4:24 p.m.
Will there be webcams so delivery customers can watch the pizza-making, too? Thu, Feb 14, 2013 : 4:15 p.m.
New York Pizza Depot! The only problems with &quot;Michigan&quot; pizza are too much dough and too little flavor. Thu, Feb 14, 2013 : 5:16 p.m. Problem with that is its too downtown in no parking/overly expensive parking land. Thu, Feb 14, 2013 : 3:02 p.m.
Is the Traver Village Domino's taking reservations for St. Valentine's Day? Thu, Feb 14, 2013 : 2:57 p.m. I think Domino's has the best pizza out of all the national chains and I greatly enjoyed the new recipe. I do wonder if some of these changes are agood idea. Take-out and devlievery is where the money is at, so I don't see the purpose of adding so much in the front of the store. Thu, Feb 14, 2013 : 2:44 p.m. I just can't see people choosing Dominos to sit down and go out to dinner. Especially here in A2. I do, however, thing those chalkboards will be fun for folks waiting for their pizzas. Thu, Feb 14, 2013 : 5:19 p.m.
Ok, Kyle you have a point for a quick sit down meal. But i do not consider a Subway seating area a place where I would like to sit for a meal. In Toledo during my youth, we had a Shakey's Pizza in a building where it was very enjoyable to eat. It was popular and I can't imagine why it failed. Thu, Feb 14, 2013 : 3:58 p.m. I feel like I'm watching the beginning of something on Valentine's Day; Romeo and Juliet. Construction Worker and Hash Slinger. You kids have fun. Thu, Feb 14, 2013 : 3:07 p.m. I guess I didn't think of it like that- as a quasi Subway or something. I still don't see it sticking, and I'm saying that as a former waitress, produce stand peddler and ice cream scooper. But if I'm wrong, we can talk this out over a pizza at Domino's- my treat. Maybe we can draw a web diagram on that chalkboard. Thu, Feb 14, 2013 : 2:55 p.m.
You've obviously never worked a job where you don't have a desk Kellie. :) For those on the road all day ie: construction crews, delivery drivers, sales professionals, etc etc having a place to sit to eat a quick lunch outside of your car is often welcomed. Think of it like going to Subway, most will take the food to go but they still have a few tables for those who want to eat there. From the looks of the photos it appears there is no more than a dozen or so seats just enough for someone to grab a quick bit, but not aimed at families looking for a place to gather and dine ala Pizza Hut or more locally, Pizza House. Thu, Feb 14, 2013 : 2:11 p.m.
To each their own. I don't like peas, so you know what? I don't eat them! Thu, Feb 14, 2013 : 1:30 p.m.
Thu, Feb 14, 2013 : 1:17 p.m.
For what it is - a national pizza chain - Domino's is fine. Sure their pizza might not be gourmet, or as creative as other local joints, but it's fine for me in a pinch. Thu, Feb 14, 2013 : 12:46 p.m. I think it's important to point this out, because I didn't in the story: Some might not like their new pizza, but sales did dramatically increase after it was rolled out. In 2011, sales were up 20 percent from 2010. 2012 year-end data isn't available until later this month, but it will be interesting to see if the growth is sustainable. Thu, Feb 14, 2013 : 12:28 p.m. Poll: What are the &quot;Top 5 Pizza Joints&quot; in the area. I pick Silvio's. Always fresh and delicious. Thu, Feb 14, 2013 : 8:53 p.m.
Thu, Feb 14, 2013 : 7:23 p.m.
Thu, Feb 14, 2013 : 5:21 p.m.
Dexter Pub makes a very good pizza. Free parking and $2 Pabst too. Doesn't get any better than that! Pizza was meant to be eaten with beer, cold beer. Thu, Feb 14, 2013 : 1:29 p.m.
NYPD, because I love east coast style pizza and also Jet's which I consider an original Detroit style pizza. Thu, Feb 14, 2013 : 1:11 p.m. Try Pizza Pinos Chicago style. Thu, Feb 14, 2013 : 12:21 p.m. I agree DiagSquirrel, their &quot;new&quot; pizza doesn't do it for me at all, its way too salty. If you compare a standard large cheese pizza, most places hover around 3000~3700 mg of sodium for the entire pizza. Domino's standard cheese pizza comes in at 5110 mg of sodium. Its just too much. Thu, Feb 14, 2013 : 12:18 p.m. This is all nice and everything, but ask them where their food products come from. What are you actually eating when you eat a Dominos Pizza? What part(s) of the pig did that sausage topping come from? How were the cows treated that produced the milk for the cheese? There isn't anybody at the location and probably very few in the chain of command over at Domino's Farms that could answer those questions because it shows up already processed in a box, bag, or can. It's the crappiest of crappy food and the reason they can charge $5-6-7 bucks for a pizza. No different over at Hungry Howie's, Little Ceasars, or the other big chains. But we buy them cheap pizzas up as fast as they can make them and in the process support the industrial agricultural complex that supply them with their food products. But I guess you can look at the antibiotics they pump into animals and the pesticides they use on vegetables as free toppings! Thu, Feb 14, 2013 : 11:16 p.m.
You have me wondering if Domino's is trying to get the capacity to sponsor a college football bowl. Outback, Kraft, Tostitos and Little Caesar's have been doing it. Thu, Feb 14, 2013 : 5:59 p.m.
@Walter Go ahead and eat your nuts and berries. You will probably get hit by a truck and die! &quot;it would force producers to put out higher quality and healthier products.&quot; And exactly what do you think that will do to prices? You say you like to know where your food is coming from. The only way you can know the Chop House is overpriced is because you have eaten there and other steak houses. Otherwise how did you compare. Just another elitist attitude from someone that will probably not live any longer or better than I! By the way. Unless you are a vegetarian you have probably eaten more unhealthy meat than I. I have eaten almost exclusively venison or beef raised on a farm I know for the last 30 years. Just because someone is selective in what they eat does not mean they are not ignorantly doing something! Thu, Feb 14, 2013 : 4:32 p.m.
Hey Walt how's the air up there? Can you see the Great Wall from your perch? Thu, Feb 14, 2013 : 3:53 p.m.
jcj - I don't shop at the big grocery stores and don't eat the crap Cottage Inn is putting out there either. I also don't eat at the Chop House because it's easily the most over-priced steakhouse in the area. I do like to know where my food is coming from and wish more people did as well because it would force producers to put out higher quality and healthier products. But you go ahead and keep happily (and ignorantly) chowing down on who-knows-what. Thu, Feb 14, 2013 : 2:08 p.m.
Walter Do you ask those questions at Kroger, Hiller's, The Chop House, Cottage Inn? I doubt it. Thu, Feb 14, 2013 : 1:54 p.m.
@Walter - I think you'd be happier with Portlandia Pizza. Thu, Feb 14, 2013 : 1:31 p.m.
Dude. Walter. Seriously. Never EVER EVER ask what's in ANY sausage. EVER. Thu, Feb 14, 2013 : 1:28 p.m.
Thu, Feb 14, 2013 : 1:02 p.m.
Thu, Feb 14, 2013 : 11:50 a.m.
Aesthetics are everything when it comes to high quality Pizza. Not. Thu, Feb 14, 2013 : 11:38 a.m. The pizza &quot;redesign&quot; didn't work out very well, so I doubt building interior redesigns will have much of an effect. Thu, Feb 14, 2013 : 2:15 p.m. I'd disagree DiagS, I would say that this will help immensely. A lot has changed in the QSR industry over the last few years to where pizza companies must compete against the likes of Chipolte and Jimmy John's. As a result many of the pizza brands are trying efforts like new menu items oriented at attracting a lunch crowd, but you can only make so many changes to your menu without scaring off already loyal customers. As a result making a design change like adding seating is probably a worthwhile investment. The worst that could come one of it is that they invest in these design updates and they fail to make a big dent in sales, but at that point all they are out is that cost as I doubt many would be turned off by a fresh clean looking space. Thu, Feb 14, 2013 : 2:12 p.m. In the 1960's, diag squirrel chunks topped many of my homemade pizzas. Thu, Feb 14, 2013 : 1:32 p.m.
Their sales have been up huge the past few years. Check your facts. Thu, Feb 14, 2013 : 11:18 a.m. Seems like a great change. Thu, Feb 14, 2013 : 11:12 a.m.
Thu, Feb 14, 2013 : 5:22 p.m.
You clearly haven't tried their new pizza. It's terrific!